This is not one of those cheap scanners that only reads one frequency. It cannot be compared in quality to other scanners which do not scan all the frequencies. Buy one for a rescue, animal shelter, business or friend. ALL PROCEEDS support our victim's services and educational outreach programs. This item will ship directly from our supplier (DROP SHIPPING). You get 1 AVID Mini Tracker III Universal Scanner and 1 NetPosse Identification Program All-ID protection registration. 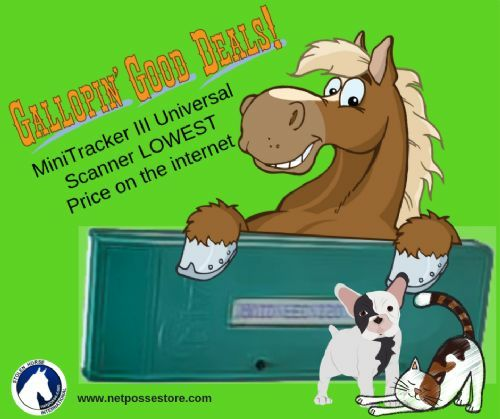 Order your scanner and then register one horse right away in our All Equine ID record keeping registry, formerly known as the NIP registry on NetPosse.com, the first to offer equine microchip kits and the only ones to offer an all equine ID record keeping registry on the internet. With over 20 years field experience working directly with victims, it is all about protection, education and recovery her at Stolen Horse International, Inc.
A portable, universal pocket reader for rapid, error-free detection of implantable transponders from different manufacturers. Reads both 125 kHz , International USEF compliance 134 kHz microchips and more. The MiniTracker 3 Universal Scanner is an Avid microchip scanner that is able to read both ISO and non-ISO microchips. It is also able to read ID tags from different manufacturers. The AVID MiniTracker 3 is engineered for convenience and performance, providing the user with the ideal solution when portability and cost are important. Reads most 125 khz and 134 khz microchips. The AVID MiniTracker 3 is small enough to carry in your pocket. Its patented Multi-Mode technology enables it to read id tags from different manufacturers. The MiniTracker 3 is configured to read and display any AVID, FECAVA, TROVAN and ISO (FDX-B) coded radio frequency identification tags. The ID code is displayed on the Mini Tracker 3's 16 character LCD. Click here to read Mini Tracker III spec sheet.